Travelling around our beautiful country is now possible for many more people. It has been made cheaper and easier with South African Tourism’s Ezee Travel Club. 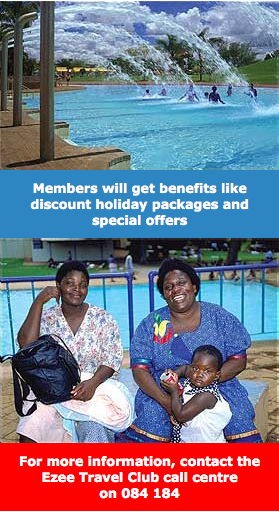 With a special savings plan, the club makes it possible for all South Africans, even poor people, to afford a holiday. South African Tourism has taken the traditional idea of Masingcwabane (a Zulu word meaning 'to bury each other’) to help the poor afford holidays. But instead of people putting their money in one account and saving for a funeral, they save their money to take a holiday at some future date. in the 'masingcwabane 'or 'stokvel 'savings plans is that each member gets his or her own savings account instead of the single shared account of 'stokvel ' members. To join the club, members must pay a joining fee of R250. They must then save a minimum amount of R99 per month in their credit account. If they want to save more, they can do so depending on what they can afford. Denys Botes, from South African Tourism said the aim of the club was to show South Africans that there were affordable holiday options. He said if more people travelled, it would also help the tourism industry to grow. Most South Africans who travel in the country, visit friends and relatives instead of using options for tourists like special accommodation and sightseeing, he said. If people used these options, more people would see the country and it would create more jobs in the tourism industry. Club members will also benefit from discount holiday packages, value vouchers, savings accounts that give them interest on their money, reduced banking service charges, information on the latest travel destinations, travel news and special offers. The idea of a travel club is not new. Like with 'masingcwabane 'or 'stokvel’, a group of members save some money every month for a future goal. With Ezee Travel Club, members contribute to their individual savings accounts which are run by the club on their behalf. When a member has saved enough, he or she may use the money to travel to any holiday destination in South Africa.